YazdiMoghaddam, J., Owlia, M., Bandarian, R. (2018). Developing a fuzzy expert system to predict technology commercialization success. 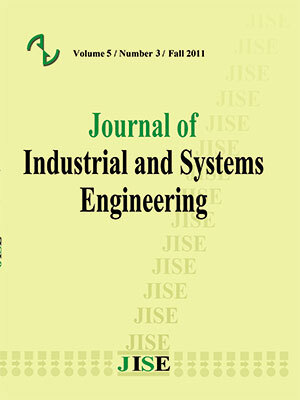 Journal of Industrial and Systems Engineering, 11(2), 228-250. Jafar YazdiMoghaddam; Mohammad Salleh Owlia; Reza Bandarian. "Developing a fuzzy expert system to predict technology commercialization success". Journal of Industrial and Systems Engineering, 11, 2, 2018, 228-250. YazdiMoghaddam, J., Owlia, M., Bandarian, R. (2018). 'Developing a fuzzy expert system to predict technology commercialization success', Journal of Industrial and Systems Engineering, 11(2), pp. 228-250. YazdiMoghaddam, J., Owlia, M., Bandarian, R. Developing a fuzzy expert system to predict technology commercialization success. Journal of Industrial and Systems Engineering, 2018; 11(2): 228-250. A majority of efforts in terms of technology commercialization have failed; however, the issue of commercialization and its high importance are agreed upon by policymakers, entrepreneurs and researchers. This shows the high complexity of the commercialization process. One of the main solutions to overcome the commercialization problems is to predict the success of technology commercialization before its implementation. Hence, this study aims to design a fuzzy expert system to predict the technology commercialization success in the early stages of its development and before its implementation. According to the literature review and the fuzzy Delphi method, the technology commercialization success factors (TCSFs) were identified and refined. The final result of the fuzzy Delphi process consists of 32 components categorized in four dimensions: technical specifications, financial and economic specifications, market specifications and rules and regulations. These success dimensions form the inputs of the prediction model in this study. The performance of the model was evaluated by actual samples selected from different fields of technology. The accuracy of the model was estimated to be 73% according to a validation process, indicating the high accuracy of the proposed model in predicting the commercialization success. This model could be used practically by risk-taking investors, technology advocates and innovators to adopt new technology commercialization opportunities. Alhabashneh, O., Iqbal, R., Doctor, F. & James, A. (2017), "Fuzzy rule based profiling approach for enterprise information seeking and retrieval". Information Sciences 394–395, pp.18–37. Amiri, M., Ardeshir, A. & Fazel Zarandi, M.H. (2017), "Fuzzy probabilistic expert system for occupational hazard assessment in construction". Safety Science, 93, 16–28. Åstebro T. (2004), "Key success factors for technological entrepreneurs R&D Project". IEEE Transactions on Engineering Management, 51(3), pp. 314-321. Balachandra, R., Goldschmidt, M. & Friar, J. H. (2004), "The evolution of technology generations and associated markets: A double helix model". IEEE Transactions on Engineering Management, 51, 3–12. Bandarian, R. (2007), "Evaluation of commercial potential of a new technology at the early stage of development with fuzzy logic", Journal of Technology Management & Innovation, 2(4), pp.73-85. Beriha, G.S., Patnaik, B., Mahapatra, S.S., Padhee, S. (2012), "Assessment of safety performance in Indian industries using fuzzy approach". Expert Systems with Applications, 39, 3311–3323. Brown, M. A. (1997), "Performance metrics for a technology commercialization program", International Journal of Technology Management, 13(3), pp. 229-244. Cheng, CH., Ching, H. & Lin, Y. (2002), "Evaluating the Best Main Battle Tank Using Fuzzy Decision Theory with Linguistic Criteria Evaluation". European Journal of Operational Research, Vol. 142, pp. 174-186. Chifos, C. & Jain R. K. (1997), "A comprehensive methodology for evaluating the commercial potential of technologies: the strategic technology evaluation method", International Journal of Industrial Engineering, 4(4), pp. 220-235. Cho, J. & Lee, J. (2013), "Development of a new technology product evaluation model for assessing commercialization opportunities using Delphi method and fuzzy AHP approach", Expert Systems with Applications, 40, pp. 5314–5330. Department Homeland Security. (2013), DHS SBIR Commercialization Assistance Workshop, 8th floor, Washington DC, pp. 6-12. Galbraith, C.S., DeNoble, A.F., Ehrlich, S.B & Kline, D.M. (2007), "Can experts really assess future technology success? A neural network and Bayesian analysis of early stage technology proposals". The Journal of High Technology Management Research, 17, pp. 125-137. Giarratano J. and, Riley, G. (2004),Expert Systems: Principles and Programming, Fourth Edition, PWS Publishing Company. Hadavandi, E., Shavandi, H. and Ghanbari, A. (2010), "Integration of genetic fuzzy systems and artificial neural networks for stock price forecasting", Knowledge-Based Systems, 23, No. 8, pp. 800-808. Haji pour, V. Kazemi, A. Mousavi, S.M. (2013), "A Fuzzy Expert System to Increase Accuracy and Precision in Measurement System Analysis", Measurement, pp.1-18. Hillston, J. (2005). A compositional approach to performance modelling, Cambridge University Press. Hsu, D.W.L. Shen, Y.C. Yuan, B.J.C & Chou. C.J. (2015), "Toward successful commercialization of university technology: Performance drivers of university technology transfer in Taiwan", Technological Forecasting & Social Change, 92, pp. 25-39. Jung, M. Lee, Y. & Lee H. (2015), "Classifying and prioritizing the success and failure factors of technology commercialization of public R&D in South Korea: using classification tree analysis", Journal of Technology Transfer, 40, pp. 877–898. Kalali, N. S. (2015). A fuzzy inference system for supporting the retention strategies of human capital. Procedia – Social and Behavioral Sciences, 207, 344 –353. Kathleen, A. R. (2003), Bringing New Technology to Market, Prentice Hall, New Jersey. Kimura, O. (2010), "Public R&D and commercialization of energy-efficient technology: a case study of Japanese projects". Energy Policy, 38, pp. 7358–7369. Kirchberger, M. A. & Pohl, L. (2016), "Technology commercialization: a literature review of success factors and antecedents across different contexts", Journal of Technology Transfer, 41(3). Kumar, V. & Jain, R. K. (2003), "Commercialization of new technologies in India: An empirical study of perception of technology institutions". Technovation, 23(2), pp. 113-120. Link, A.N. & Scott, J.T. (2010), "Government as entrepreneur: Evaluating the commercialization success of SBIR projects", Research Policy, 39, pp. 589-601. Linstone, H.A. & Turoff, M. (2002), The Delphi Method Techniques and applications, Online Available: www.inei.org.br/ inovateca/estudos-e-pesquisas-em inovacao/ delphibook.pdf. Martyniuk, A. O., Jain, R. K. & Stone, H. J. (2003), "Critical success factors and barriers to technology transfer: case studies and implications", International Journal of Technology Transfer and Commercialization, 2(3) pp. 306-327. Mirghafoori, S.H. Sadeghi Arani, Z. and Jafarnejad, A. (1390), "Forecasting success of commercialization of innovative ideas using artificial neural networks; the case of inventors and innovations in Yazd province", Iranian Journal of Science and Technology Policy, 4(1), pp. 63-76. Mohan, S.R. & Rao A.R. (2003), "Early identification of innovation and market acceptable technologies-A model for improving technology transfer capabilities of research institutes". Journal of scientific &industrial research, 62, pp. 865-875. Mohannak, K. & Samtani, L. (2014), "A Criteria-based Approach for Evaluating Innovation Commercialization", DRUID Society Conference 2014, CBS, Copenhagen, June 16-18, pp. 1-15. NASA Office of the Chief Technologist, (2012), NASA Procedural Requirements: NASA Technology Commercialization Process, Chp.3, pp. 1-5. Pal, D., Mandana, K.M., Pal, S., Sarkar, D. & Chakraborty, Ch. (2012), "Fuzzy expert system approach for coronary artery disease screening using clinical parameters". Knowledge-Based Systems, 36, 162–174. Rahal, A.D. & Rabelo, L.C. (2006), "Assessment Framework for the Evaluation and Prioritization of University Inventions for Licensing and Commercialization". Engineering Management Journal, 18(4), pp. 28-36. Ravi K. Jain, R.K., Martyniuk, A.O., Harris, M.M., Niemann, R.E. & Woldmann, K. (2003), "Evaluating the Commercial Potential of Emerging Technologies". Int. J. Technology Transfer and Commercialization, 2(1), pp. 32-50. Rostek, K. (2014), "Modeling Commercial Potential of Innovative Projects". International Review of Management and Business Research, 3(1), pp. 78-95. Rubell, M. L. G., & Jessy, J. C. (2016). "A multiple fuzzy inference systems framework for daily stock trading with application to NASDAQ stock exchange". Expert Systems with Applications, 44, 13–21. Siler, W. & Buckley, J. J. (2005), Fuzzy Expert Systems and Fuzzy Reasoning, John Wiley & Sons, Inc.
Slater S.F. & Mohr J.J. (2006), "Successful Development and Commercialization of Technological Innovation: Insights Based on Strategy Type". Product Innovation Management, 23, pp. 26-33. Sohn, S.Y. & Moon, T.H. (2003), "Structural equation model for predicting technology commercialization success index (TCSI)". Technological Forecasting & Social Change, 70, pp. 885–899. Yen, J., & Langari, R. (1999). Fuzzy logic: Intelligence, control and information. Prentice Hall, ISBN: 0135258170. Zadeh, L.A., Kacprzyk, J., (1999). Computing with words in Information/Intelligent systems 1: foundations. Physica 33, 10. http://dx.doi.org/10.1007/978-3-7908-1873-4. Zahra A.H. & Nielsen A.P. (2002), "Sources OF Capabilities, Integration and Technology Commercialization". Strategic Management Journal, 23, pp. 377–398.